While on a short walk , I found this little guy on a tree lost in some thoughts. I was almost close by and took few shots,but he didn't care to move. When I walked few yards and looked back he was still there..! Looks like he has some issues in the woods ! Great shot of this odd looking squirrel! you are so creative, you capture all sorts of things... football games, baseball, now this.. keep up the good work, I enjoy seeing whats next.. Nice detail!! Very nice catch, beautiful light. 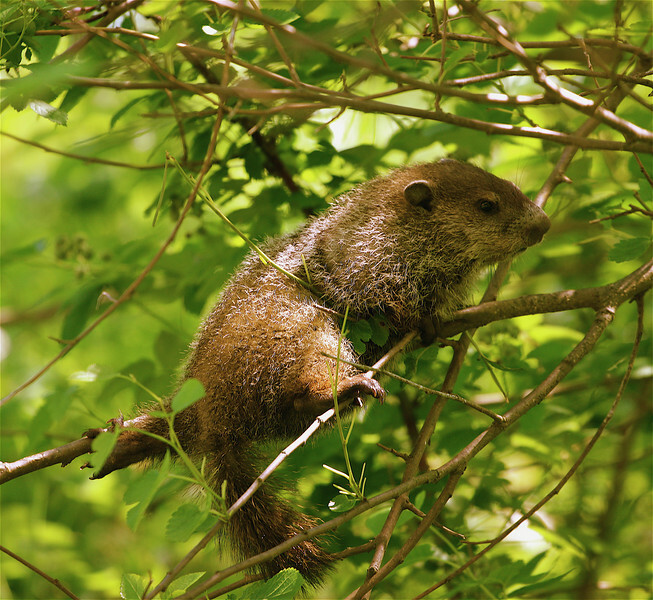 Saw a groundhog (or what I thought it was a groundhog) recently in a tree, and had no idea they like to climb. Here's mine, definitely older than yours, which makes me think it's not that uncommon. Great catch! Very nice detail. Don't know what it is, but I'm guessing it's young and perhaps a little disoriented. Interesting catch -- makes one wonder what's going on. if that's agroundhog, no wonder he's confused. Didn't know they could climb. He looks a little confused, nice shot!